At Energy Matters, we walk the solar talk. 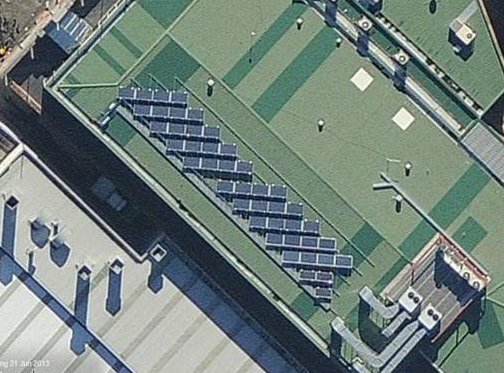 Our City Road, Southbank office in Melbourne, Victoria has 10kW of solar panel capacity installed on its rooftop. But it’s not your average system and it doesn’t just supply our office with all its power needs. It’s actually several systems we use to test and monitor the performance of various components and configurations; plus allows our customers to examine solar equipment in action. Here’s a satellite snapshot of our solar rooftop’s current configuration. The following are current specifications of our HQ’s rooftop solar arrays, along with links to further information with regard to the various components. The Energy Matters Power Monitor is a small device installed near a switchboard that measures the electricity production of a solar power system and a building’s power consumption. It sends the information securely to a central server via our WiFi network and broadband connection. The My Energy Matters Power Monitor portal is where results and charts can be viewed and alerts set. It’s a very user-friendly application that is also accessible via hand-held devices such as smartphones. Many of our customers are now using the Energy Matters Power Monitor to keep tabs on their system’s electricity production and consumption and to help to improve their energy efficiency efforts. Ask us about incorporating the Energy Matters Power Monitor as a inclusion with your solar power system – call us today on 133-SUN.